For many years doctors thought that such things as spicy food, stress, smoking and lifestyle habits were the major causes of stomach pain. It all changed in 1982 when it was discovered that a majority of stomach pain and ulcers were actually caused by germs. A major player among these germs was found to be the bacteria Helicobacter Pylori (H. pylori). H. Pylori is a very common bacteria and it’s estimated that over 60% of the world’s population has it in their bodies. Many people come into contact with the bacteria when they are younger, but it can affect adults too. Researches have noted that it is very commonly found in people that live in countries that lack clean water and proper sewage systems, but a true source of the bacteria has not been confirmed yet. It can be transferred from one person to another by simply coming into contact with another person’s saliva or other bodily fluids by doing such things as sharing drinks or sharing eating utensils. 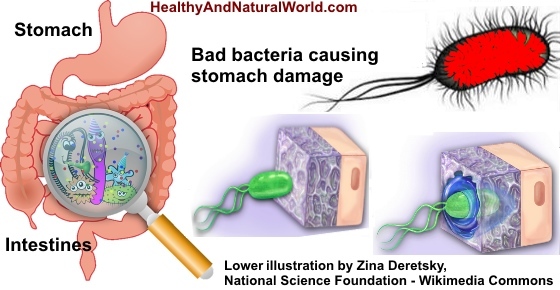 For most people the bacteria does not show a lot of symptoms in their body and they probably will never even know it’s there, but for others it may aggressively attack the lining of the stomach. After the bacteria severely damages the stomach lining it then exposes the affected person’s stomach wall to the acid that their body uses to digest food. It can eventually lead to such conditions as infections, peptic ulcers and even stomach cancer. Helicobacter pylori infection in your stomach is also one of the main causes of having too much stomach acid (hyperchlorhydria). The presence of the bacteria can easily be detected by testing blood, breath and stool samples. Current treatment for the bacteria calls for a regimen which consists of antibiotics and antacids but there are natural ways to deal with the H. Pylori bacteria as well. Let’s take a look at some of the natural methods of treating H. Pylori that people have experienced some success with. This is a resin that is sourced from pistachio tree and it is used as a food ingredient in the Mediterranean region. Here is what a study led by Farhad U. Huwez, M.R.C.P., Ph.D. from Barnet General Hospital in the United Kingdom concluded about Mastic Gum: “Even low doses of mastic gum — 1 mg per day for two weeks — can cure peptic ulcers very rapidly, but the mechanism responsible has not been clear. We have found that mastic is active against Helicobacter pylori, which could explain its therapeutic effect in patients with peptic ulcers”. That is some pretty strong evidence and you might want to give this one a try if you think you suffer from H. pylori. It has also shown no known side effects with its use. Mastic gum is available in chewable wafers or as capsules (like this one). We have both good and bad bacteria in the body. Probiotics, which consist of live bacteria and yeast, are considered to be a healthy or good bacteria. Several studies have reported that certain probiotic strains can exhibit inhibitory activity against H. pylori bacteria. Contrary to popular belief, bodies do need bad bacteria inside them to function properly; the trick is keeping a healthy balance between the good and bad bacteria. Probiotics are what helps keep this healthy balance in check. Probiotics can be found in yogurt and fermented foods (such as sauerkraut, kimchi, kefir and pickles). It is recommended that a person have at least 2 – 3 servings of these per week or you can use a probiotics supplement like this one. Further reading: Read about fermented foods in my article Top 10 Fermented Foods and Why You Should Eat More of Them. Also find 9 reasons to take probiotics and why it’s so good for you. Cranberry juice has long been thought of as a natural medicine around the world and there is thinking now that it helps prevent or limit H. Pylori bacteria from attaching itself to the lining of the stomach. One study from the oncology department at Peking University checked the effect of cranberry juice on the bacteria. The participants were assigned to orally receive two 250-ml juice boxes of cranberry juice or matching placebo beverage daily for 90 days. Eleven individuals from the cranberry juice treatment group and only two from the placebo group were negative at 35 and 90 days of experiment. These results are significant. The conclusion was that regular consumption of cranberry juice can suppress H. Pylori infection. Another clinical study conducted by researchers from Israel showed that people who drink a cup of cranberry juice cocktail twice a day are three times more likely to ward off infection with the bacteria than those who do not. The results have been reported in The Inside Tract issue 122. The researchers found then that compounds in cranberry juice inhibited the progress of three different strains of H. pylori and concluded that elements derived from cranberry juice showed promise as a possible therapeutic agent to eradicate or reduce the H. pylori flora in the stomach. The researchers from Israel had demonstrated in the laboratory that cranberry’s bacterial anti-adhesion mechanism might be a new tool to fight ulcer disease. Further reading: Cranberries are also effective in treating urinary tract infections – read my article on How to Treat Urinary Tract Infection (UTI) Naturally. Learn about the amazing healing properties of cranberries and other berries in my e-book The Healing Berry Guide. This e-book will teach you how to transform your health with berries. There is some evidence that active Manuka honey completely inhibits the growth of H. Pylori bacteria. A study done by a research group from the Department of Biological Sciences, University of Waikato, Hamilton, New Zealand came to this finding in a study that was published by the ‘Journal of the Royal Society of Medicine’. According to the research the Manuka honey completely stopped the growth of the bacteria. When you buy Manuka honey, make sure it has high MGO value (like this one) – the higher the MGO rating in Manuka honey the higher the level of anti-bacterial activity in the honey. Here is a list of edible herbs that are thought to help control H. Pylori bacteria in the body. They can conveniently be added to flavor any foods you may be preparing. Further reading: If you are interested in herbal remedies, you can find more useful information in my e-book The Herbal Remedies Guide. This guide will teach you how to treat common ailments using herbs. A Spanish study published in the Journal of Agricultural and Food Chemistry suggests virgin olive oil may help prevent and treat H. Pylori infections. Laboratory tests showed the antioxidant compounds found in virgin olive oil are effective against several strains of H. Pylori bacteria. Researchers say these results must now be replicated in humans. But if future studies confirm the findings, incorporating virgin olive oil into your diet may help treat or prevent painful stomach ulcers. You can read more about olive oil in my article: How to Use Olive Oil As a Medicine. A few studies have reported many natural plant extracts with anti-H. pylori activity, including garlic, broccoli, cranberries and green tea. Grapes are well known for their high levels of antioxidants and polyphenols, have also shown promise as novel antimicrobial agents. A few studies have already reported the anti-H. pylori activities of grape seed and red wine. This is a cold-pressed oil produced from the small kernels (pine nuts) of certain species of pine trees around the world. It is not only a gourmet cooking oil, but it also has a long history of therapeutic use in Russian and Chinese traditional medicine to treat diseases of the stomach and gastrointestinal tract. It was used as an old Siberian folk remedy for pylori bacteria, for acid reflux, and even for peptic ulcers. The indigenous peoples in Siberia used to drink one or two teaspoons daily of this oil. Pine nut oil can be ingested 30 minutes to one hour before intake of food over a period of 21-24 days. It’s also a great as a healthy salad dressing or to drizzle on foods to add an extra kick to a meal. You can buy organic extra virgin Siberian pine nut oil online. DGL (Deglycyrrhizinated licorice) – this is form of licorice which can be taken in chewable tablet form. You can chew 1-2 tablets three times a day. Scutelleria baicalensis/ Baikal skullcap can work as an antibiotic. Note that Baikal skullcap can slow blood clotting, so if you are taking aspirin, a blood thinner, or have a clotting disorder, or are having surgery, talk to a your doctor before taking this supplement. Baikal skullcap can also affect blood sugar levels and lower blood pressure. Korean red ginseng has shown anti- H. pylori activity in lab animals. Please be aware that red ginseng is different than American ginseng and has a wide variety of uses. While many regard ginseng as effective in increasing mental performance and sexual function, it also lower blood sugar, increase heart rate and can either raise or lower blood pressure. If you are interested in trying red ginseng, talk to a knowledgeable healthcare professional first. It is important to consult with your doctor before taking any herbal or natural supplements to make sure they don’t interfere with any of the medications you are currently taking. doctor had found impression of Chronic H.pylori duodenitis through endoscopy also presence of a dense lymphoplasmacytic infiltrate in the lamina propria with the formation of lymphoid follicles and germinal centres along with few polymorphs and eosinophills. Rod shaped organisms seen on the surface of the mucosa and crypts. No evidence of dysplasia/lymphoepithelial lesions seen..
I’m not a doctor Raj so I cannot give specific advice. You need to follow up with your doctor regarding the endoscopy findings.